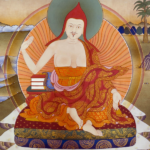 The online seminar series introduces the Madhyamaka or “Middle Way” teachings, the foundational view of emptiness/nonduality upon which all Buddhist practice is based. The seminars are based on Dzongsar Khyentse Rinpoche’s teachings on Chandrakirti’s Madhyamakavatara, the Heart Sutra, and the Vajracchedika Sutra, as well as other related teachings by Rinpoche such as the Two Truths and the Four Seals. The program outline and information about each week and pre-reading may be found here. Audio/Video recordings of the teachings are available in English. Program text: "Introduction to the Middle Way"
If you would like to download a free copy of Dzongsar Khyentse Rinpoche's commentary on the Madhyamakavatara, the reference text for the program, you can do so here. If you have questions, please first check the FAQ as the answers may already be there. If this does not answer your questions, please see the Help page.